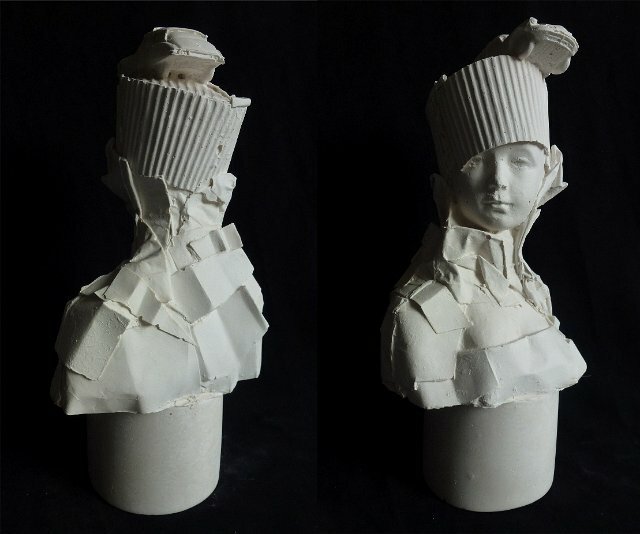 My latest bust is a departure in some ways from previous sculptures in the collection as I've started looking at contemporary fashion - particularly Japanese design - for references for the costumes. 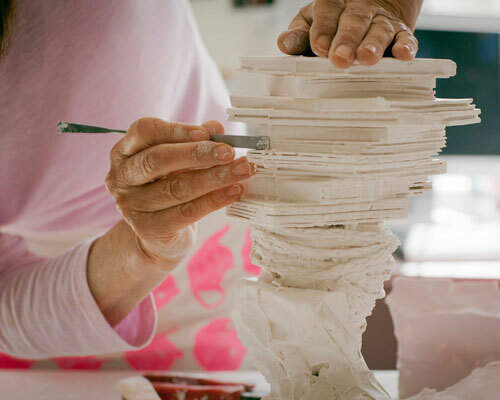 Pulling the silicone mould (as below) away from the first cast - it came out well! Doesn't always happen. As you can see her hat is 'adorned' with a Citroen DS - the car made famous in the iconic 1960s TV serial featuring the Georges Simenon sleuth, Maigret - hence her name. You can catch a glimpse of the Citroen here. 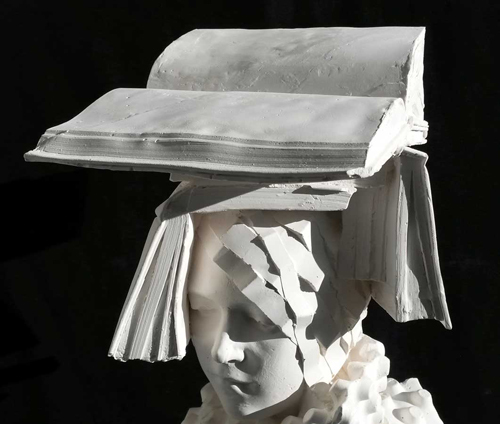 I made the costume entirely from paper and card - scrunching it and folding it - using newspaper in the photo shoot referred back to these original materials. 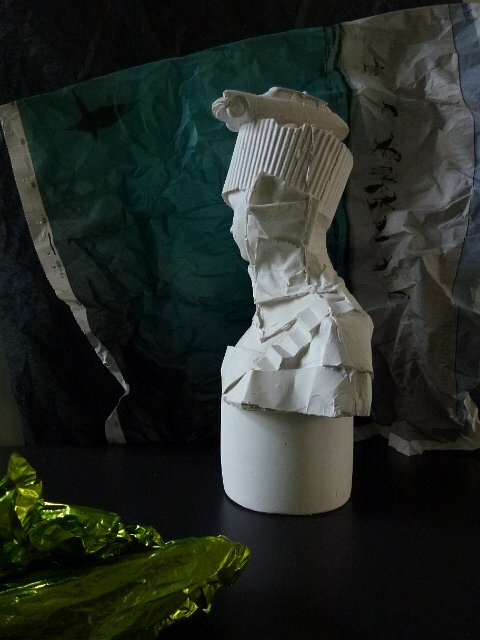 The green foil paper I found on a country walk - someone's discarded balloon - great how discarded rubbish can be transformed into something intriguing and glamorous in another setting. As always, I purposefully keep the mould lines in the final cast. 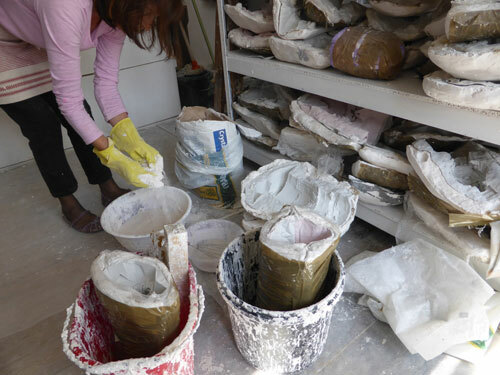 The fact that my finished sculptures have an air of roughness and imperfection is very important and no two busts are the same despite coming from the same mould, the antithesis of a mass-produced object. 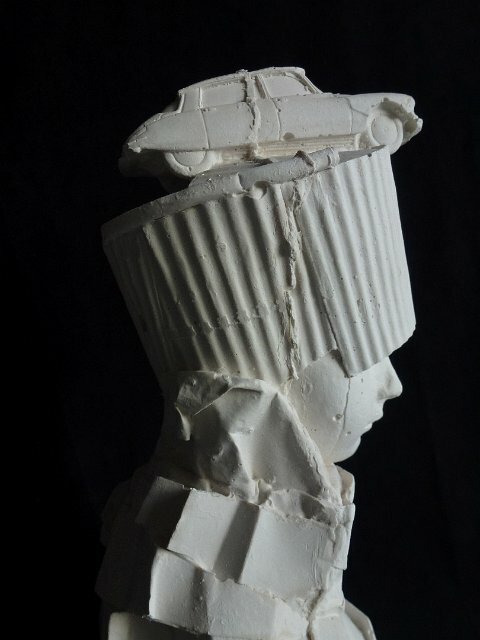 The hat and collar I cast from paper take-away cups. I'm really getting interested in using discarded and low-key materials to create my costumes. 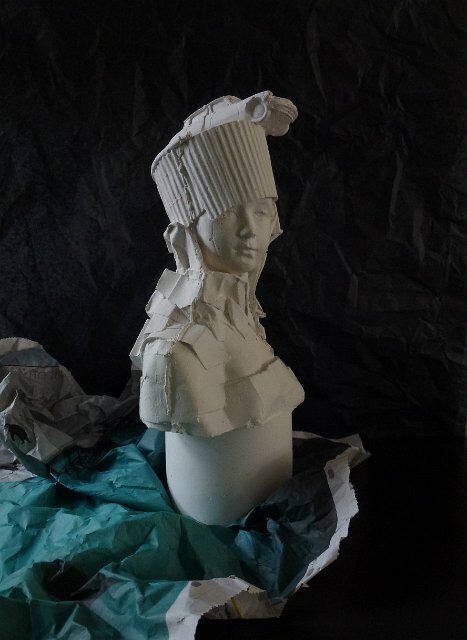 Mme Maigret was one of the hardest busts to make so far - working with stiff paper and card, it's hard to manipulate the shapes and get them to sit around the form. 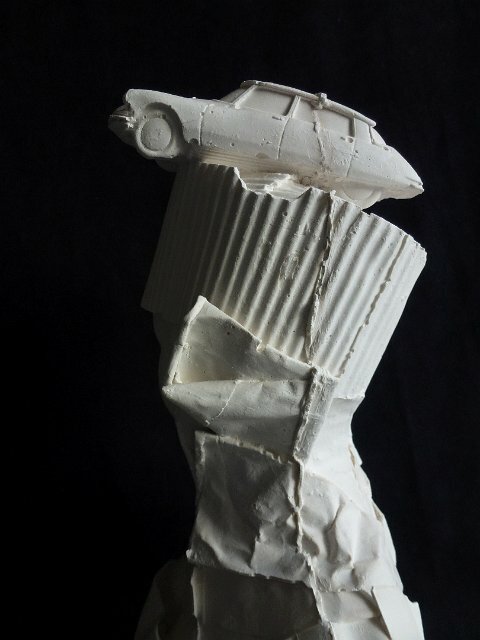 In researching Japanese contemporary fashion design, I've been amazed by how sculptural the designs are and I'm finding it exciting to keep discovering more. I've made 2 other busts using these references and am just completing the moulds now - looking forward to seeing how they come out. 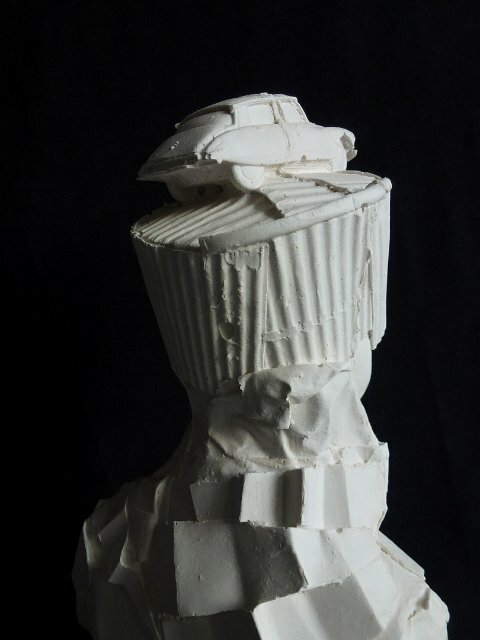 And also looking forward to my first project of 2012 which will be........ creating two busts to celebrate the London Olympics!! It's not that I'm at all a sporty person but I think there's an ocean of crazy and interesting imagery to work with. Absolutely dying to get started, and who knows - maybe they'll be the must-have souvenirs of London 2012! Thanks to all my readers during 2011 - I really appreciate your interest and feedback. Happy Christmas! Hi there from Canada! MERRY CHRISTMAS!!!! I like the departure very much. It is interesting how it still relates to the antique costuming of the previous busts. I'm looking forward to seeing the other two. Hope you have had time to watch the first of Jonathan Meades cult views of France, there was not only an original DS going through its paces but the results of your Dads OAS Assassin in 1962 and two hours before I'm commenting on Ronchamp in your Model Village blog and there it is getting a thumbs up from JM. You should look up his films about Belgium on youtube, I think you would get his black humour after the Alsace Lorraine introduction to his style! !